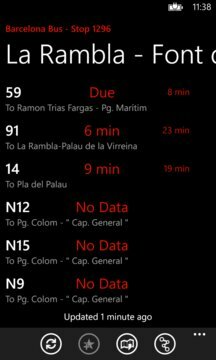 Barcelona Bus shows you how much time it will take for the next bus to reach a bus stop for all bus stops in Barcelona and surrounding areas. + See the nearest stops around you. + See which lines stop on each stop. + See the routes of each line. + Save stops to quickly view them later. Includes bus stops from the following towns/cities: Badalona, Barcelona, Castelldefels, Cornellà de Llobregat, El Prat de Llobregat, Esplugues de Llobregat, Gavà, L'Hospitalet de Llobregat, Montcada i Reixac, Montgat, Sant Adrià de Besòs, Sant Boi de Llobregat, Sant Feliu de Llobregat, Sant Joan Despí, Sant Just Desvern, Santa Coloma de Cervelló, Santa Coloma de Gramenet, Tiana and Viladecans. The developer of this app has no relationship with the company that provides the data (AMB), so data may be inaccurate.